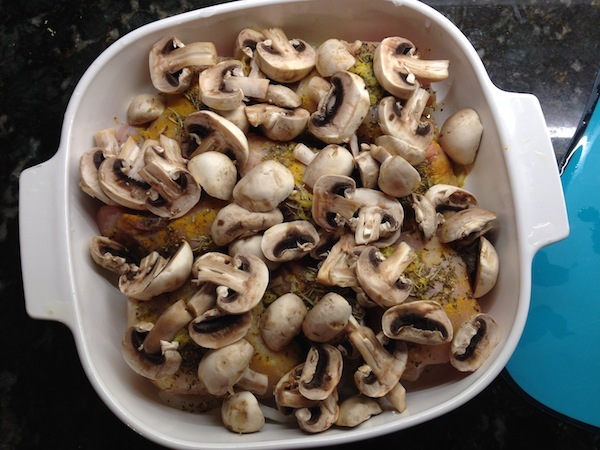 Double-Lemon Baked Chicken | Keep It Up, David! Here’s an easy dinner idea for you. I whipped this up in Michigan, when my friend Lauren came over for dinner, and truth be told, I kinda made it up as it went along. But it ended up being a hit with Lauren, my dad, and my cousin, so… you should try it too! And here’s a fun fact to sweeten the deal: this recipe has no added fat. The only fat on the plate is the fat in the chicken (some I which I trimmed off). So pig out – this is guilt-free! 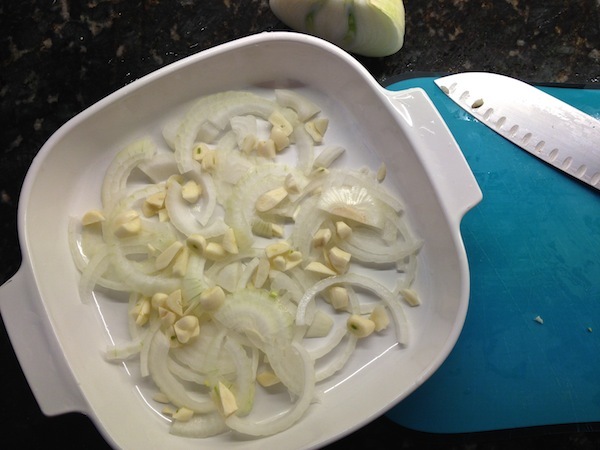 …garlic and onions! 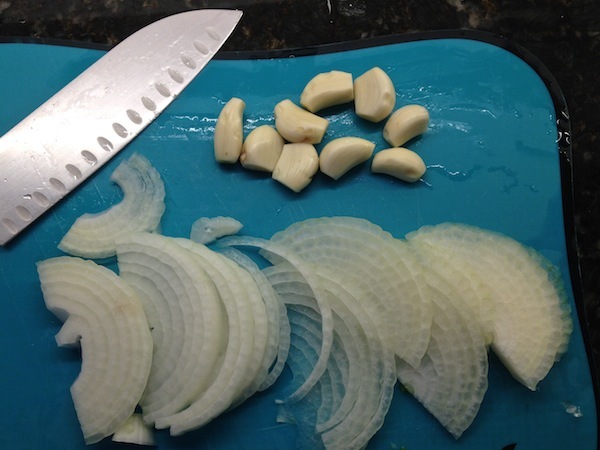 In this case, 1/2 a white onion, thinly sliced, and nine garlic cloves. (I was planning to use eight, but then there was only one left, so what the hell). I chopped the garlic a little bit, but not too much – maybe each clove into three or four pieces – and then spread them out in a square casserole. Next up, the chicken. I used a mix of thighs and breasts. 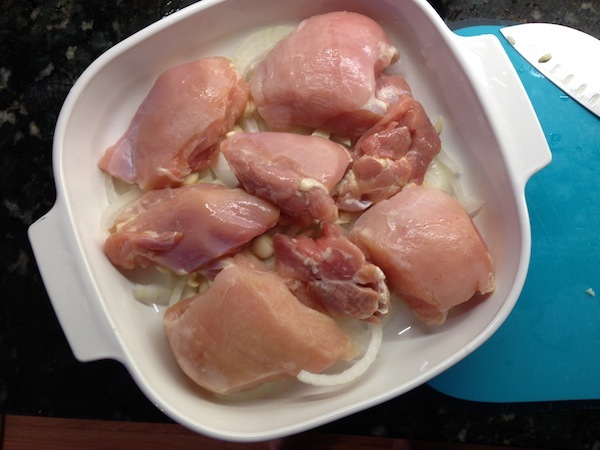 If you get your hands on really giant breasts, you may want to cut them in half, so they’re about the same size as the thighs – that way, everything will cook evenly. Spice time! I used a little salt, pepper, and liberal amounts of turmeric, dried rosemary, oregano, and thyme. Now it’s time for the double lemon part. I call it double because I used both the zest of a lemon and the juice, and because we had another 1/2 lemon lying around, I juiced that too. 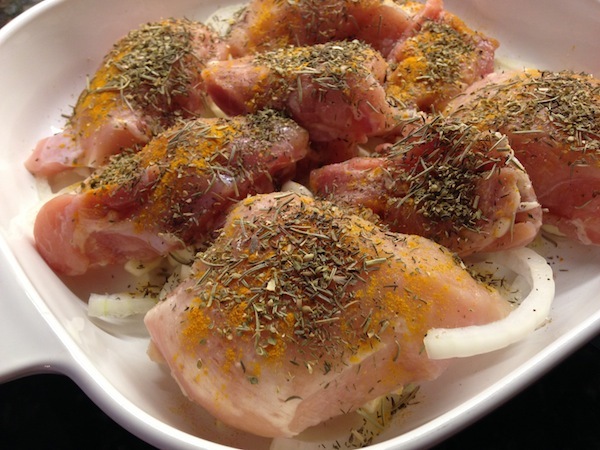 I divided the zest between all the pieces of chicken, and doused every piece with some of the juice. The final ingredient was a carton of button mushrooms, which I sliced. This went into a 425-degree oven for about 40 minutes. I covered it for most of that time, thinking it would cook faster. Since we were hungry, that seemed like a smart choice. So I suppose the chicken was sorta baked and sorta steamed? 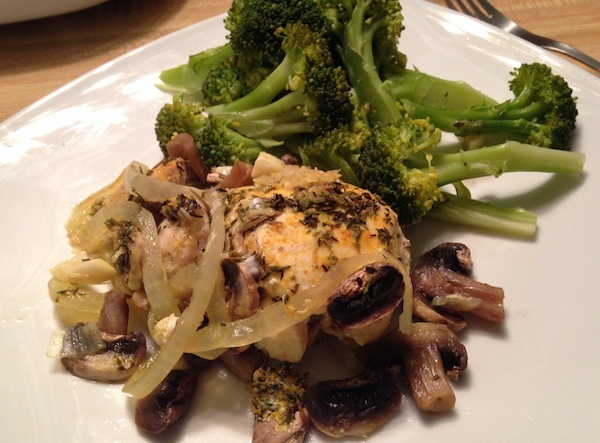 RELATED CONTENT: Peruse All Kinds of Healthy Recipes on My Recipe Page! It doesn’t really matter. What does matter is that it was delicious. Tender, juicy, and incredibly flavorful. By the time I pulled it out of the oven, a nice broth had formed at the bottom, so we spooned some of it over the top. For a side dish, I steamed broccoli, and when it was done, hit it with a couple tablespoons of lime juice. 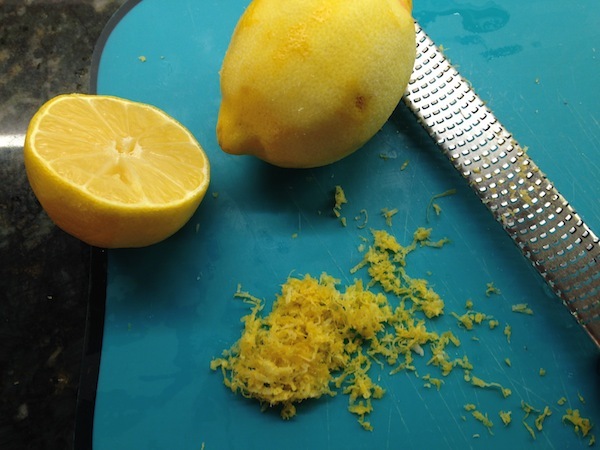 (I would of used lemon, but I forgot to save some.) Wanna see the final result? Lauren brought dessert, which was an assortment of fresh berries – the perfect way to end the meal. I could totally make this again with twice the chicken, and eat leftovers for a couple more meals. It’s that good. And plus, it’s really really really really good for you. Really. This entry was posted on Wednesday, March 4th, 2015 at 12:45 am and is filed under Uncategorized. You can follow any responses to this entry through the RSS 2.0 feed. You can leave a response, or trackback from your own site. This looks wonderful, I did something similar with honey, and it came out great! Thanks for sharing. Yes, indeed, it looks yummy.